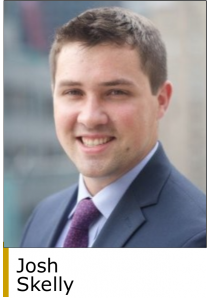 Corridor Capital has added Josh Skelly to its investment team as a Senior Associate. Mr. Skelly will be active with the evaluation, diligence, financing and execution of new investments and will provide support to Corridor’s portfolio companies and management partners. Before joining Corridor, Mr. Skelly was a Senior Associate with First Atlantic Capital where he was responsible for sourcing, evaluating, executing and monitoring investments with a focus on the specialty packaging sector. Earlier in his career, while attending business school, he held associate positions with both CIP Capital and Lightview Capital. Mr. Skelly began his career with Deloitte Consulting as a Strategy & Operations Consultant, advising private equity firms, middle market companies and large corporations on growth and corporate strategy, operational improvement and private equity due diligence. Mr. Skelly has an MBA from Columbia Business School and a BS in Finance, Accounting & Information Systems from Boston College. Corridor Capital makes control investments of $3 million to $12 million in mid-market companies with EBITDAs of $2 million to $5 million. Corridor focuses on complex situations, particularly those requiring growth support or operational or financial engagement. Sectors of interest include specialty manufacturing, business services, and environmental services. Corridor’s investor base includes approximately 150 executives across an array of industries and disciplines that the firm uses as an active resource for its portfolio companies and their teams. The firm is based in Los Angeles (www.corridorcap.com).